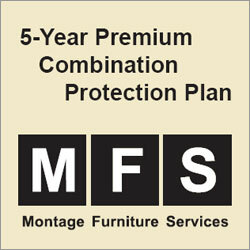 Furniture Protection Plans from Montage Furniture Services are a great value. For only $99 you'll enjoy piece of mind for 5 years. Your Montage Furniture Protection Plan covers a variety of incidents. Buying furniture sets online, site unseen, can be a challenge. Here at Von Furniture you can trust that you will receive great prices, great furniture sets and friendly service, and the Montage Protection Plan offers you extra piece of mind. For 5 years your purchase is protected from the accidents in daily life. If you're like us and have children and pets, this plan is a must. Imagine your child scratching your beautiful new cherry dining room table...You're covered! 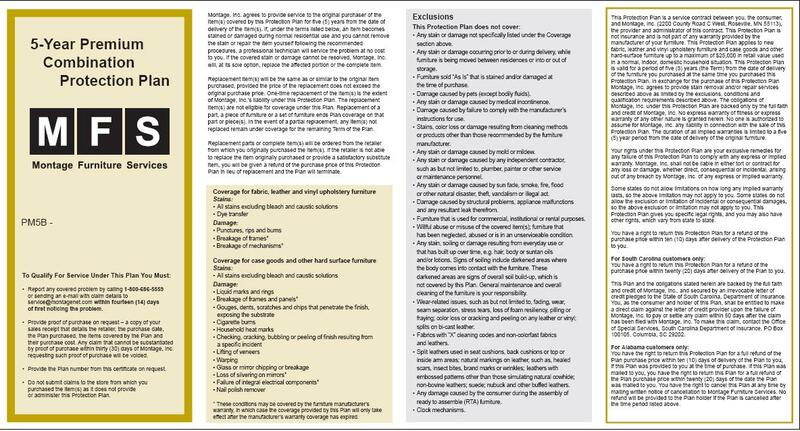 Montage Furniture Protection Plan warranties are mailed once your furniture set ships. The paperwork will have a convenient toll free number to call for claims, your unique customer number and their policies for repair and replacement.